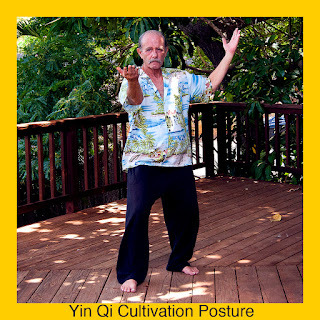 Whether we practice Tai Chi for health or martial arts, the inclusion of Zhan Zhuang (Standing Meditation) at the beginning of our daily training session becomes essential if we are to gain many of the greatest benefits spoken of in the Tai Chi Classics and historical anecdotes. For health, Zhan Zhuang training initiates the body’s internal healing, strengthening, unification and enhanced Chi flow which is then amplified by proper Tai Chi practice. In this case Zhan Zhuang becomes the Yin to Tai Chi’s Yang. While Tai Chi is often thought of in terms of stillness within movement, Zhan Zhuang may be considered as movement within stillness. Simply put, they are the perfect compliment to one another. For martial arts, the intimate connection between Zhan Zhuang and Tai Chi is a matter of historical record. Ever wonder about the great accomplishments and stories of the famous martial artists of days gone by? Well, pretty much all their feats of martial prowess and/or radiant health would not have been possible without the inclusion of standing meditation to grow, balance and expand their internal power. That, along with training the form and application techniques 8-10 hours a day, made these famous masters appear almost super-human. In his work, ‘The Complete Book of Yiquan,’ Mr. CS Tang a native of Hong Kong, states that even Bruce Lee practiced Zhan Zhuang as part of the Yiquan training he received from the renown master Liang Zipeng. Lee was greatly impressed by among other things, Yiquan’s instantaneous explosive power gained through extensive standing meditation. Many of the separate benefits of Zhan Zhuang and Tai Chi are quite well known. But how is it that Zhan Zhuang’s influences directly benefit, improve and eventually transform one’s Tai Chi practice? An important part of the improvement of our Zhong Ding has to do with the opening of the Central Channel. The ability to feel a sense of ‘physical emptiness’ and later the flow of Chi in this area and indeed throughout the entire body leads not only to stronger internal power, but also far better and long-lasting health. Another element of our Tai Chi form which is also greatly enhanced through Zhan Zhuang training is our sense of whole-body perception and unification; unified movement being one of the basic goals of our form practice. This idea is expressed in the Tai Chi Classics in the phrase, “...one part moves, all parts move. It is well known that prior to Tai Chi’s opening movement, Chi Shr - Commencement, we stand with our feet parallel at hip or shoulder width with our arms hanging at our sides. In the olden days this posture (Wuji Zhan Zhuang) was maintained for an hour before beginning the form movements. In addition to this Wuji posture, Tai Chi practitioners of yesteryear also maintained the seminal Tai Chi postures of Peng, Lu, Ji, An and Dan Pien. (Single Whip) These postures were generally trained individually, and held for prolonged periods of between 30 min to 1 hr. 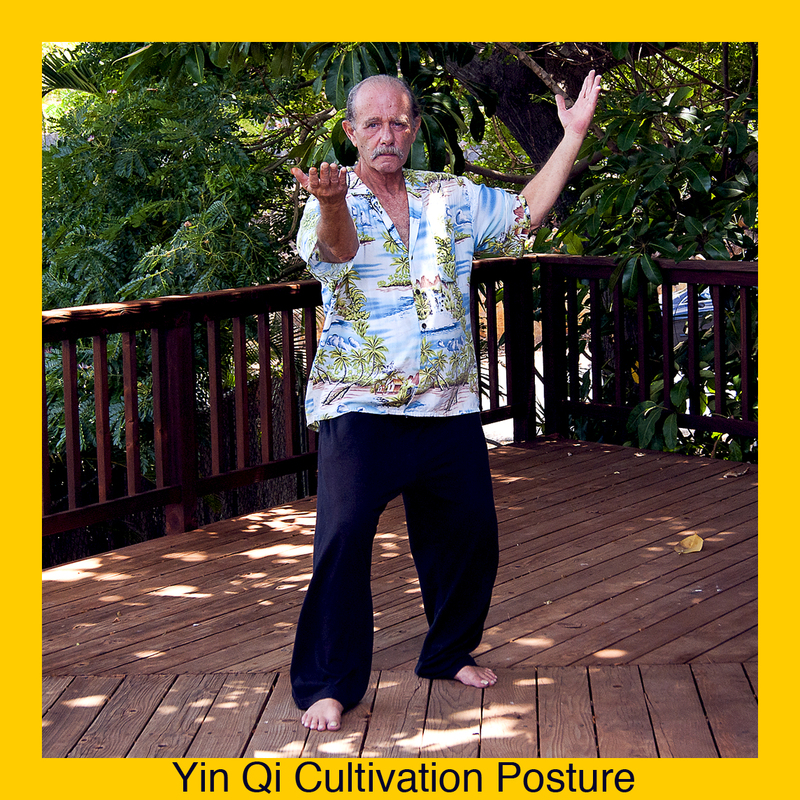 (Usually one posture per day) The value of holding Tai Chi postures as described above, is truly astronomical in its ability to advance and elevate the quality and power of our overall form. In addition to the above methods, a more gentle, gradual way to incorporate the Zhan Zhuang element into our Tai Chi form practice is to simply stop and hold the ‘end’ of each posture for between 1 and 3 breaths (or more) before proceeding to the next movement in the form. I highly recommend trying out this method. Because if you do one thing is sure; each posture that is maintained in the manner described will rapidly take on an entirely different - more relaxed, integrated and ‘open’ feeling than ever before. Start your set as usual. When you reach the 'end' of a posture - pause - then exhale and inhale. Feel a 'sinking' from the base of skull and the secret spot in the brain (at the intersection of the eyes and ears) all the way under the feet on the exhale. When you inhale again, feel an overall expansion of the entire body from the low Dan Tien out to the extremities which propels you into the next movement. Also, during the suspension of movement feel the body making micro-adjustments in the posture itself. Once you’ve gone through the set or sequence you’ve been training, repeat it again in the way you normally practice and see what differences you feel. Here's a simple exercise to help develop Upper Body Spiral Energy while training Zhan Zhuang. After a dozen rounds or so, notice how lubricated and open your shoulder joints, elbows, wrists and hands are. Taijiquan can be practiced at a number of speeds, depending upon one’s purposes. Usually for health and vitality a fairly slower speed is optimum. By fairly slow I mean what we usually think of as ‘normal speed’ when we see people practice in a group, in a park, on TV or with their teacher, or even alone. Most people think that for Taijiquan to be practiced properly it should be ‘slow, smooth, even and continuous,’ and of course this is correct. This is the basic method and one that even advanced practitioners return to again and again. 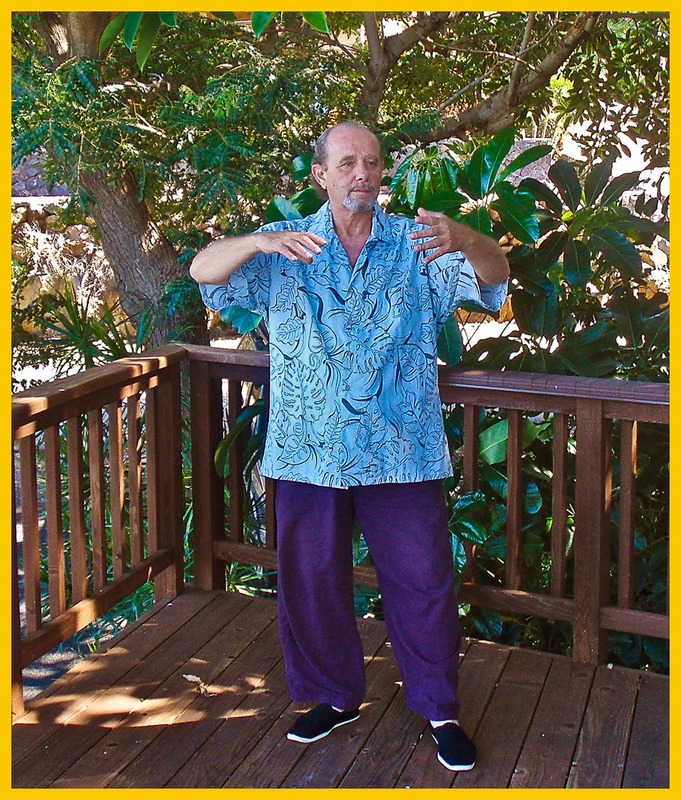 The reason for this has to do with how Taijiquan practice effects and changes the body. 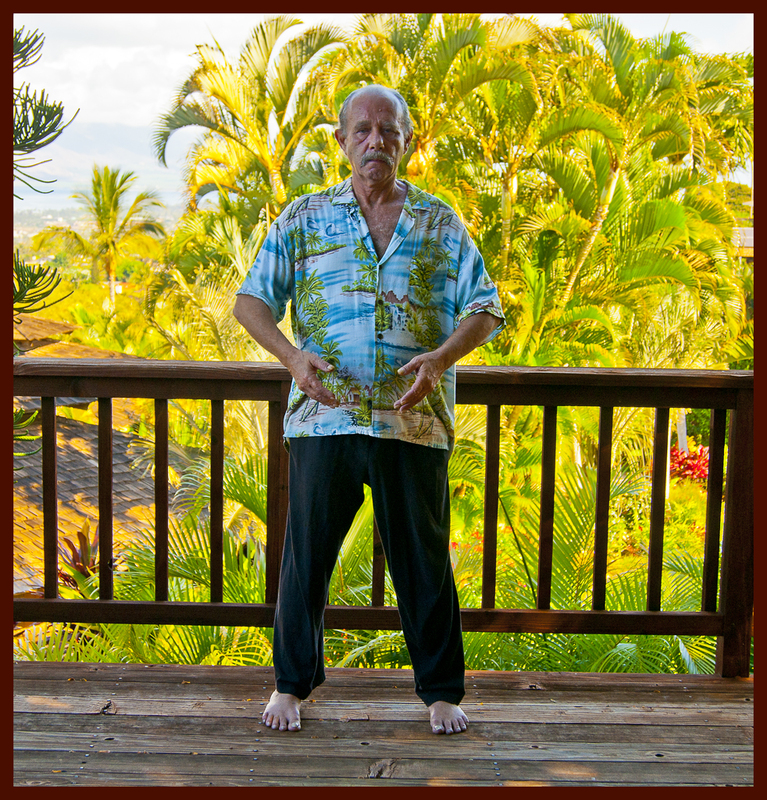 Like all methods of Qigong (Taiji is both a Qigong and Nei gong system) the physical motions of the forms create a beneficial elongation of the tissues (muscles, tendons and ligaments.) This has the effect of generating a life changing elasticity which manifests as a strength similar to that of an Olympic swimmer rather than of an Olympic weightlifter. Besides the ‘normal’ speed mentioned above, there is another speed which is also most beneficial for improving health and is slightly faster than ‘normal.’ This speed can be likened to that of a ‘freely flowing river.’ For those seeking ‘radiant health,’ as well as for those desiring martial power, another necessary stage of training is ‘Extreme Slow practice’ where the long form takes a full hour to complete. Finally for dedicated martial artists there are the Fast Speed practices, designed to eventually generate continuous power as well as fluidity. Now let’s look at each of these in a bit more detail. The actual speed of this varies somewhat depending on the teacher(s) we’ve learned from. On one level, what happens is this: doing something slowly, again and again, establishes better and better muscular control. This is similar to how a concert pianist learns and memorizes a piece of complicated music. Practicing the piece over and over establishes absolute muscular control on the physical level and inters this control into the subconscious. Once this has occurred, the pianist can easily play through the music with little if any conscious thought necessary. The same is true of the Taiji form. Seasoned practitioners often describe it as if the form ‘played itself.’ When this happens, our mind is free to remain in the all-important low Dan Tien as the Classics recommend. This speed is somewhat faster than ‘normal speed’ and even more continuous in the blending of the beginning and end points of each posture and transition. Eventually it becomes difficult to tell precisely where one movement stops and the next one begins. This can also be described as the ‘harmonizing’ of the Yang outgoing movements with the Yin incoming movements and is a most excellent speed to develop and maintain a robust and healthy circulation. The rolling-like feeling of the movements emulate a freely flowing river, rising, falling, turning, twisting, all the time moving effortlessly onward in each moment. This is actually far more difficult than it may appear at first. A traditional long form might take a full hour to complete. This old-fashioned method of training allows us to root out even the most subtle glitches in our movements, refine our muscular control to very high levels, as well as greatly deepen our relaxation and whole body linkage and connectivity to the point where everything effortlessly comes and goes from the low Dan Tien. Also, extreme slow speed often provides a far greater opportunity to experience the sensations of energy moving to and from the low Dan Tien and throughout the entire body. ‘Faster speed’ is often described as involving smooth, rapidly flowing movements combined with Fa Jin releases. Once this method is accomplished and we are comfortable with it, there is a still faster method which some have termed the ‘Flag-Waving’ method. This method utilizes the rebound from the Fa Jin issuing of each movement to generate the next movement and Fa Jin release. (Issue-rebound, issue- rebound, etc.) The final result is a fully applied solo Taiji fighting form with appropriate power in each movement as it might actually be used against a serious opponent. In appearance, the practitioner almost seems to ‘bounce’ from one small-frame movement to the next. An entire long form might take only about 10 minutes or so. Finally, it is important to know that each speed we choose to practice at will generate a unique feeling. Each of these different feelings are correct for their particular speed. Some of these feelings are only slightly different from ‘normal speed’ practice, while others differ quite radically. But despite these differences, each method will be found to adhere to the essential, universal Taiji principles. The idea of Masterpoints comes from a time that predates most of the current incarnations of standing meditation. These powerful points were derived from Taoist philosophy and Chinese Medicine theory both of which are known to be several thousand years old. There is evidence in the form of ancient drawings and carvings of Zhan Zhuang postures on cave walls in China that have been dated at over 1000 years old. What are Masterpoints? It has been found through many generations of experience that certain locations on and within the body have a powerful influence on the human system. 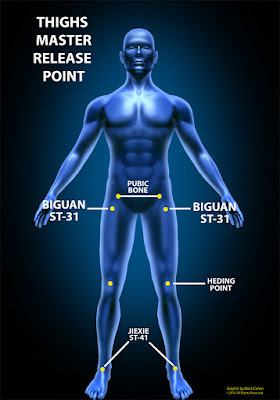 While many of these points effect internal organs and the like, others have the ability to control and release large swaths of muscle and sinew located around them or in their general proximity. Many practitioners have contacted me recently wanting to know how to get their upper legs to fully relax during their Zhan Zhuang practice. Since this is something that most everyone deals with, especially in the first 1-3 years of training, I will discuss two Masterpoints, one to release the thighs in front and one to release the hamstrings in back. The first point, Biguan, St-31 (See Diagram) is located at the intersection of two lines; a horizontal line at the level of the perineum and a vertical line moving downward from the superior iliac crest. In terms of Chinese Medicine theory we would say; directly below the anterior superior Iliac spine, level with the perineum or; inferior and medial to the great trochanter of the femur, between the sartorius and tensor fascialata muscles. Please note that although this location is found on the surface of the body, the actual point is approximately 1.5-3 inches below the surface, depending on one’s overall size. When properly activated, Biguan point will release the muscles on the front of the thigh all the way down to where they connect with the knee. These will include the ‘quads’ (the 3 vastus muscles and the rectus femoris) and the sartorius muscle. This point also influences the lower attachments of the psoas muscles as well. The second point we’ll examine is Yinmen, Bl-37. (See Diagram) This point is located on the back of the thigh halfway between the center of the fold of the buttocks (where the buttocks meet the back of the thigh) and the center of the crease of the knee. This point is also said to be located on a line roughly halfway between Chengfu point Bl-36 (in the middle of the transverse gluteal fold) and Weizhong, Bl-40/54 located at the midpoint of the transverse crease of the popliteal fossa between the tendons of the biceps femoris and semitendinosus muscles. Yinmen point is found at a depth of about 1-2.5 inches, again depending on the size of your legs. So now that we’ve located these two Masterpoints, the question then becomes; what do we do? At first it is often advantageous to use your finger or thumb to press deeply into the location, such that you feel a ‘sensation’ or even pain. 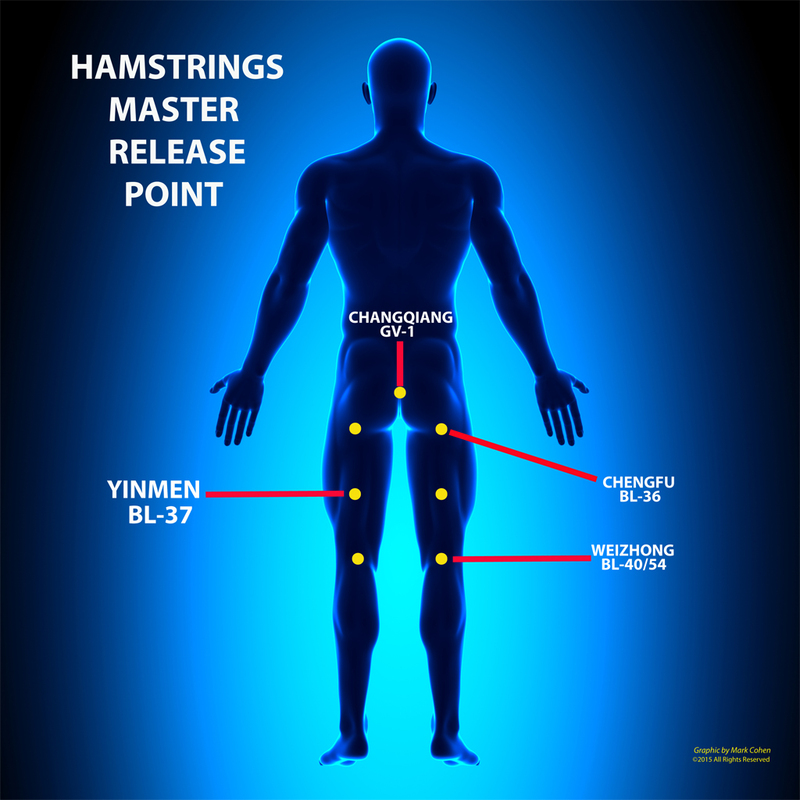 When you get the right location and depth, a pain sensation or deep ache tell you that you’ve got the right spot, as well as help remind you of the precise location once you assume your Zhan Zhuang posture. Later, with enough practice, it will no longer be necessary to press but rather simply move your feeling-awareness to the point in question (at depth inside the body) and hold it there. Whichever method you choose, once you’ve firmly established the location, then begin to physically relax the Masterpoint itself and as you do, feel how this relaxation percolates out further and further until in front, you feel the whole thigh relax, while in back you would feel the hamstrings thoroughly let go. When done correctly these relaxations will also effect parts of the kua, knee, ankle and foot in front and the low back, buttocks, sacrum, knee, ankle and foot in back. Try these two points a few times and see for yourself. Once learned, you will have developed a powerful new ‘shortcut’ into deeper relaxation within these particular regions as well as throughout the body in general. And since everything we gain in standing meditation, both for health and martial power comes through greater and greater relaxation, Masterpoints become an important and compelling component in our Zhan Zhuang relaxation toolbox. 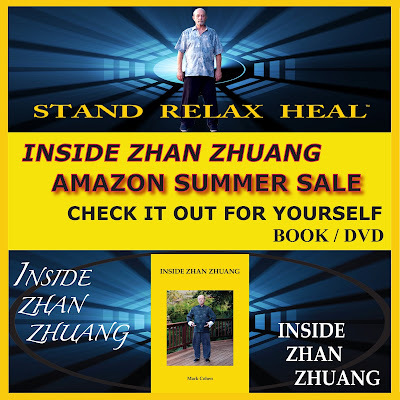 A detailed explanation of Zhan Zhuang Masterpoints can be found on the DVD, Inside Zhan Zhuang - Standing Meditation for Beginners and Seniors. And this is what most people are interested in, for martial power and the like. And this is natural because these are the things we first encounter as we follow through in our training, both with Zhan Zhuang and indeed in any of the internal arts. But there is a whole other side to what we ordinarily call Qi. And that is the Yin aspect or ‘Yin Qi.’ Of course all this is based on Chinese Medicine theory and Taoist thought. After one has developed ‘frame,’ which includes root and the ability to both absorb and issue power in what we might call a highly ‘visible’ manner, it then becomes possible to begin the exploration of the Yin or ‘mysterious’ Qi. Why mysterious? 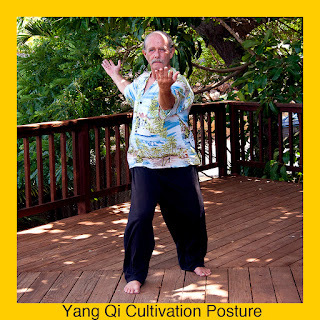 Because in order to properly cultivate and later utilize Yin Qi, it first becomes necessary to let go of a number of cherished martial arts beliefs. Basically this means that ordinarily we will equate speed and ‘strength’ with power. But in the world of Yin Qi we must give up this notion because with the Yin Qi, basically the opposite is true. This means that with Yin Qi, when we feel ‘strong,’ we are in fact weak, and when we feel ‘weak’ or perhaps a better word is effortless, that’s when we’re actually very strong. So, what is the value of this Yin Qi? Well, besides the obvious health application, for martial arts it goes something like this. It is said Master Wang Xiang Zhai used Taijiquan Yin Qi aspects for neutralizing and diverting, Bagua for footwork and Xingyi generation methods to issue power. So the usefulness of Yin Qi in internal martial arts has to do with its ability to stick and adhere and lead into emptiness. A most useful skill in setting up for or simultaneously returning devastating Yang Qi power. The big difference when cultivating Yang Qi versus cultivating Yin Qi is that with the Yin Qi we must let go of all the normal feelings of strength and power and instead go for a most profound form of relaxation and focus, such that we may even let go of the shape of our outer form or structure almost entirely, and rely solely on our ‘internal frame’ which we have cultivated over the years, to support our outer structure and later also to deal with incoming power. Try these for yourself, 5-15 minutes per posture and then switch sides for a total of between 20-60 minutes. 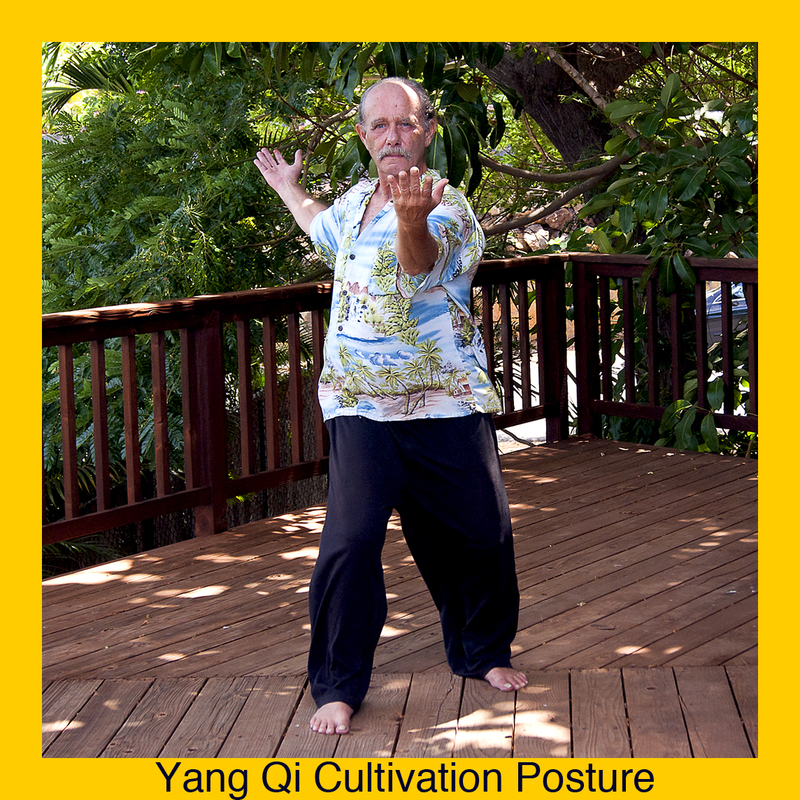 Be sure to start with the Yang posture on each side. When we first begin our Zhan Zhuang training we are told to settle into the posture and find our ‘center’ and hold our attention there. But then what? And what is our ‘center’ anyway and what does it do? And finally what can we expect by maintaining our focus there? Another way to say it is; our centerpoint is located halfway between top and bottom, halfway between left and right (sides of the torso) and halfway between front (navel) and back. (Ming Men on the spine.) The intersection of those three lines specifically determines our centerpoint. Now you might ask, “What about the Low Dan Tien (elixir field), so important to Tai Chi and the other internal arts, shouldn’t that be our point of concentration? Paradoxically the answer is yes. 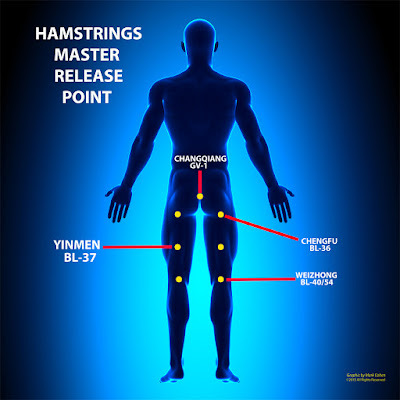 The reason for this is because after a long period of concentration in the Low Dan Tien, (generally several years) eventually the Dan Tien will ‘open’ and this opening will create a sense of expansion so as to also include the area from the navel through the pubic bone, back through the Ming Men point and down through Hui Yin. (The confluence of Yin.) So at the beginning for Zhan Zhuang the Low Dan Tien is the preferred starting point of focus although it is interesting to note that in traditional Taoist meditation the navel and the area behind it is used as the primary focus starting point. In order to understand the importance of the Dan Tien we must realize that the human body is composed of more than just the physical tissue we can see and feel. In fact, there are a number of ‘energetic overlays,’ so to speak, which continually function both inside and also beyond the periphery of our body, 24/7. It’s just that we are generally not aware of them. But daily Zhan Zhuang training will slowly but surely change all that as it increases our perception and our ability to feel more deeply and subtly into our body in a holistic sense. We know from Chinese medicine that the Qi or vital energy travels constantly through the body, through the nervous system, along with the blood as Ying or nutritive Qi, through the organs, bones and glands and much more. In fact, every physical process throughout the body has its energetic counterpart. And this is the key to transitioning from experiencing purely physical feelings to what we might call ‘energetic feelings,’ that is, things functioning at a higher harmonic that we can subtly but definitely feel - only at a higher frequency or vibratory rate. The idea of vibratory rates is of note. In terms of science, physicists are quite clear. Everything in our physical universe they assert, actually vibrates. And the speed at which things vibrate helps determine all the varying appearances, shapes and forms we see in our world. They have also proved that solidity itself (physicality) is actually an illusion, albeit a very powerful one. This has to do with our basic atom structures and the tremendous amount of space that exists between any nucleus and its various electrons. Building on these scientific realities, we can delve into the tangibility and purposes of the Low Dan Tien/Centerpoint or lower elixir field. From these basic definitions one can see the nearly infinite potential and possibilities of this internal elixir that we are cultivating. One function of our Low Dan Tien/Centerpoint is as a focal point to draw in, accumulate and store Qi. Usually the first sensation we feel as this is happening is some form of warmth or heat. And as our ability to focus one-pointedly increases, so does the degree of heat. Eventually the Low Dan Tien region will feel quite hot. One example of this is Master Wang Shu Jin. It is said that before their frigid early morning winter training sessions, the students would gather in front of Master Wang and warm their hands as if warming them in front of a blazing fire. When asked about this and his other extraordinary abilities, Master Wang always credited the Qi. It is said that when the Qi becomes abundant enough it will overflow the bounds of the Dan Tien and travel throughout the body. This influx of vital energy has tremendous healing effects on the entire human system. Another important thing about the Low Dan Tien/Centerpoint is its ability to function as a cauldron or ‘cooking pot.’ As we hone our skill of exclusive concentration, we bring to bear more and more of our total consciousness and this in turn creates the effect of ‘cooking’ the Jing-Qi, which further purifies and refines it. This practice eventually leads to various alchemical experiences, many of which are thoroughly outlined in the Taoist tradition. (The 3 Treasures - Jing, Qi and Shen) The interesting thing about Zhan Zhuang practice is that whereas the Taoists follow specific methods and procedures to illicit various experiences, many of these same experiences will occur spontaneously over the years of daily Standing Meditation practice. Lastly, we can think of our Centerpoint or Low Dan Tien as a doorway which allows us to explore a whole energetic realm or structures, including linkage between the Central and Left and Right ‘Qigong Channels,’ the 3 Dan Tiens, the 14 Acupuncture Channels, the ‘Psychic Channels’ (Yin and Yang Linking and Heel Channels) the ‘Belt‘ Channels, the ‘Thrusting Channel etc. all of which have the potential of strengthening and transforming our physical systems, thus promoting health and vitality into old age. After one has spent enough time training Zhan Zhuang, it becomes possible to lift one’s feeling-awareness point of focus from the Low Dan Tien to the Upper Dan Tien. The timing of this shift is often the result of the ‘opening’ of the low Dan Tien (at least to some degree) and its subsequent linkage or connection with the Middle and Upper Dan Tiens. This alchemical experience is first initiated within the Central Central and then creates a sense of expansion of awareness that goes far beyond the confines of the physical body. One element to the idea of Dan Tiens ‘opening’ is that of a sense of vastly expanded space, seemingly within the body and yet somehow also beyond it. As Master Wang Xiang Zhai has said, “When I stand, the earth is in my hands. The universe is in my mind.” Another element to all this is the fact of Shen (spirit, spirit of vitality) controlling and leading the Qi (vital energy) which in turn motivates the body. As the classics say, “...the mind leads the Qi and the Qi leads the body.” Therefore you have as an end result, the mind leading the body or - Shen (spirit) ruling our corporeal form. And the location where all this takes place - the Upper Dan Tien. This idea of connatural action comes into play in both our standing meditation practice and then again in martial or Fa Jing application. During our Zhan Zhuang sessions we are repeatedly cultivating relaxation with an eye to resolving blockages and achieving whole-body-linkage. This includes everything from the basic alignment of the bones through the stretching, wrapping/unwrapping of the tissues, all the way to working with the bone marrow and brain at the deeper levels. So, with enough proper Zhan Zhuang training, we eventually find the body transposes the sense of Zhong Ding (Central Equilibrium) we have achieved in our standing practice and applies it subconsciously in our everyday lives. Many people have told me that while waiting in line at the supermarket, Starbucks or the bank, they find themselves adopting a relaxed subtle variation of a Zhan Zhuang stance without any conscious effort on their part. This is relying on the body’s innate wisdom and desire to heal itself. One confirmatory sign of correct practice in this regard is the fact that after some months’ training we find that in relationship to relaxation for example, what used to take us a whole session to achieve, now occurs within the first 5 or 10 minutes and for the remainder of the session we find ourselves delving deeper into more and more subtle states of relaxation. So... we have various instincts that we are born with and others which are acquired experientially, in other words - connatural. But what is instinctive for one might be completely antithetical to another. Witness the ‘fight or flight reaction to the sudden increase of adrenalin. The point of this is to realize that the definition of ‘being natural’ in a very real sense is unique to each individual. And this definition can be further refined to include our interpretation of ‘natural’ varying during each session, and indeed really from one moment to the next. And just what is ‘natural strength’ anyway. One aspect is the ability to use the whole body linkage we have attained through Zhan Zhuang in a viable way while moving and issuing power. It is this subconsciously fused unity that allows us to manifest strength from any part of the body at will, instantly. But natural force or strength can only come into play after we have mastered our ‘fight or flight’ reaction triggered by the adrenals during either vividly simulated or real-life ‘threatening’ situations. The idea with this is, the more intense, wild and angry the attack is, the more we become centered, calm, charged, and focused as our Qi automatically sinks in preparation for instantaneous action. It is from this and similar states of consciousness that our ‘natural strength’ can spontaneously emerge of itself. Another important aspect of ‘natural’ in the context being discussed, is the idea of being uninhibited, that is, not restricted by any mental concepts or emotions. Grandmaster Lee called this optimal state - “Mind of No Mind,” in other words - Wu Wei. This state can be reached in terms of the connatural aspect after all martial techniques necessary have been mastered and then interred deep in the subconscious so they are ‘as natural as breathing,” and things seem to happen ‘automatically’ or without conscious thought. From the examples iterated above we can see that the natural state so often talked about is actually a fluid one, rather than static or fixed. And so it is also for the manifestation of natural force or strength.